The Beam is, for all intents and purposes, a living room speaker first, everything else second. As much as 60 per cent smaller than the Playbase and 28 per cent smaller than the Playbar. 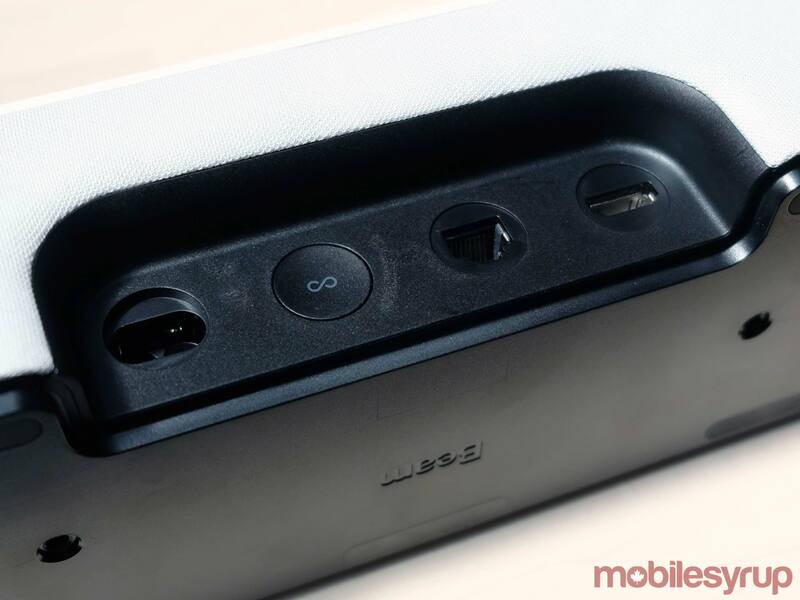 Since Sonos won’t be retiring the Playbar, it gives the company three uniquely designed speakers for the TV. Some sacrifices were made to cut the Beam down to size, but by including an HDMI port (finally), engineers were also able to trim the fat in the back. It’s a powerful speaker, but until I get to test it in real-life conditions, I can only speculate. Either way, hands-on time at the launch event in San Francisco indicated that sound travels out of it the right way. Sonos squeezed in four drivers and three passive radiators, two of which are angled laterally to flow out left and right. It’s the same technique engineers used with the company’s other two TV speakers to create a wider soundstage. Five microphone arrays round out the key components inside. The hardened plastic frame looks and feels like the same material Sonos used for the Playbase. The Beam is considerably prettier than the Playbar, which looks a little dated with its demonstrable soundbar form factor. 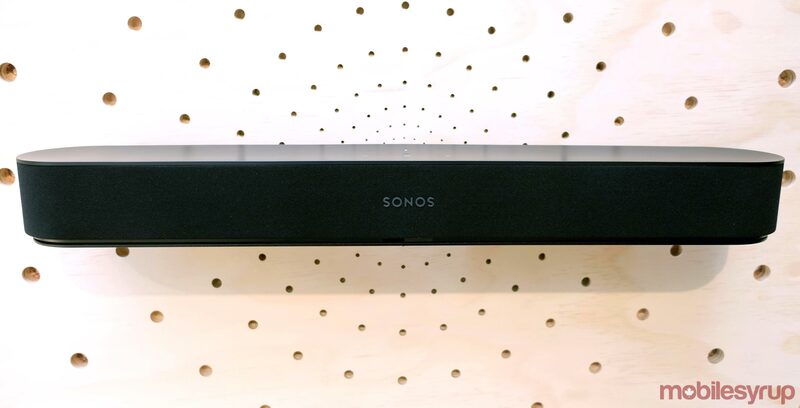 There are two screw mounts underneath the Beam to mount it, and photos of it on the wall for this story are of the official Sonos wall mount for the speaker. Coming in the standard black and white variants the company is known for, the neutral shades mirror exactly what they did with the Playbase as well. It doesn’t look like there are any plans to experiment with other colours in the market. I mentioned HDMI earlier, and its addition means the elimination of any optical and Aux-In ports from the back. All you get is HDMI, Ethernet and the power socket. The minimalist approach fits with a key demand for some home theatre enthusiasts who wanted the flexibility of HDMI. Throwing it in is arguably a concession, but it has more to do with controlling your TV by voice. Amazon Alexa already works with the Sonos One, and will work out of the box with the Beam as well. Google Assistant will join the party sometime this year, but no one at the company gave any sort of timeframe. Tying in the TV so closely to the speaker means the Beam, through Alexa, can turn the TV on or off on command. I could tell it to continue watching The Man in the High Castle on Prime Video, or Stranger Things on Netflix. The demos were impressive, particularly in the responsiveness, but again, only thorough testing will reveal the mistakes that can happen when trying it. The catch to this integration is that it will only work with a Fire TV device. If your TV has a smart TV interface with Netflix built-in, for example, the Beam won’t be able to tap into it on that interface. That also means that, by default, adding Google Assistant will enable Chromecast functionality by voice on the Beam. If they can get Roku and Apple TV going, that would cover a whole lot of streaming ground. Which brings us to Siri. Sonos confirmed it will release AirPlay 2 compatibility in July for its newest speakers: the Beam, Playbase, Play:5 and Sonos One. It doesn’t look like any previous speakers in its lineup will get that update. iOS users will be able to ask Siri to play music from Apple Music and send it to any of those supported speakers. 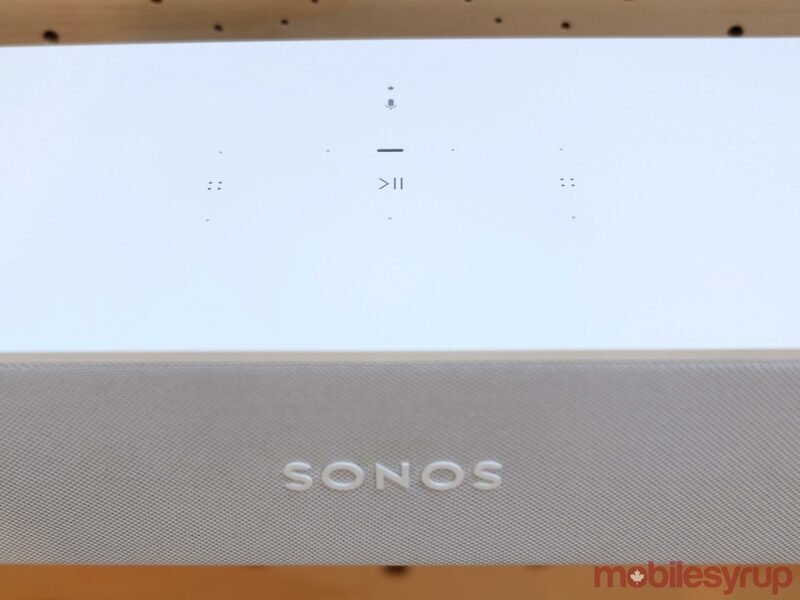 However, it can’t control playback or push the tunes to another Sonos speaker in your setup. That’s where Alexa could take over. I asked about how this limited Siri integration might work with music stored on the iPhone. That’s more a question of how Apple’s voice assistant would index and recognize the songs and artists, but if they are synced to Apple Music via iTunes, they should be playable by voice. Siri won’t be able to play anything that isn’t stored within the Apple Music app, otherwise. 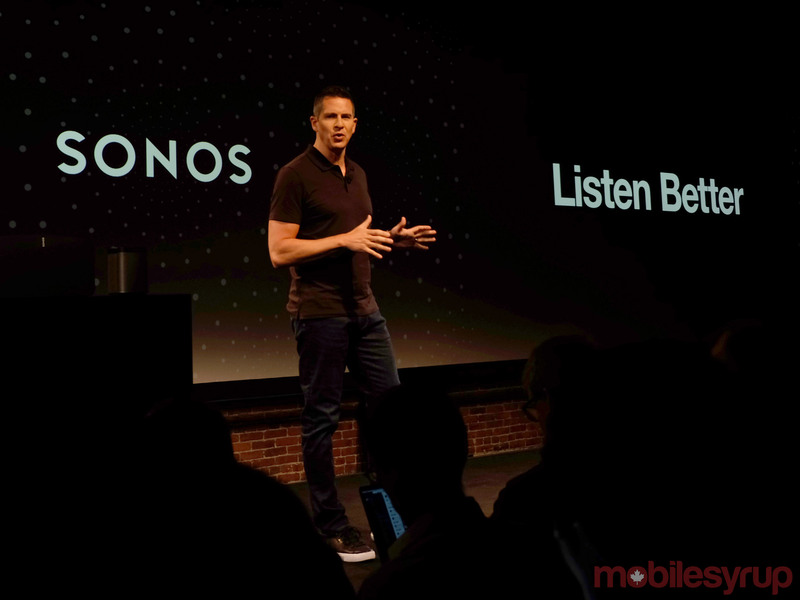 Sonos created the ideal conditions for demonstrating a speaker like this. Small, enclosed makeshift rooms surrounded by wooden walls to help with the acoustics. I got to hear three different songs and watch three short movie clips. The Beam’s spatial separation and resonance was impressive. It’s loud without letting distortion set in, and highs and mids are warm and clear. Only the bass was lacking a little, which was to be expected. The Playbase produced better bass than the Playbar. 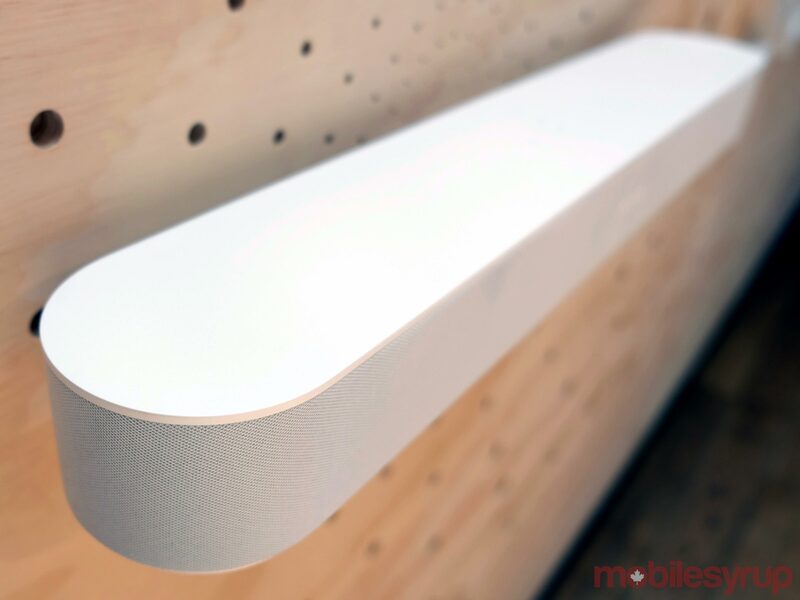 Based on my initial impressions, the Beam is closer to what the Playbar manages. That’s not to say it’s bad, only that it could use a little more thump in its delivery. For the sake of contrast, the Google Home Max offers deeper bass, but not quite as broadly warm highs and mids. It’s kind of like comparing the Play:1 to the Play:5, with the Beam and Playbase in their stead, respectively. Once I get to test one, I can see how well the Beam performs in a variety of situations, including for gaming, which wasn’t mentioned at all during the keynote or subsequent demos. Sonos is taking pre-orders for the Beam now on its website for $499, with shipping and retail availability kicking off July 17. Whether or not that’s also the date AirPlay 2 goes live is unknown at this time.